Words Alive's 2016 Share Your Love of Reading event was a huge success!! Our goal was to spend the month of February sharing the importance that literacy plays in every aspect of our lives. We partnered with 24 VIR's including; Mayor Kevin Faulconer, NBA Legend Bill Walton, Retired Hall of Fame Jockey Julie Krone, The San Diego Padres' Friar and Pad Squad, The San Diego Gulls, Coucilmembers Lorie Zapf and Myrtle Cole, City Supervisior Dave Roberts, NBC's Jodi Kodesh, ABC 10News Megan Parry, Virginia Cha, Renee Nelson, Robert Santos, Brandon Lewis and many many more! Click HERE to see more photos of the VIR's in the classrooms. By bringing VIR's and media attention into the classroom we were able to continue our goal of "making reading matter" by showing students how reading plays a part in life success in all different pursuits and career paths. At Words Alive, our mission is “to open opportunities for life success by inspiring a commitment to reading.” and thanks to our wonderful supporters and partners Share Your Love of Reading was able to do just that! Check out KUSI's clip on the right to see Mayor Kevin Faulconer at Golden Hill Elementary on February 19th. In addition to our Share Your Love of Reading classroom involvement, during the month of February we also had a "share a #shelfie" campaign to raise donations and awareness to the importance of literacy. 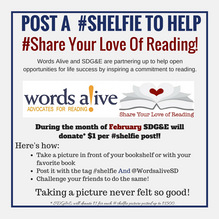 Thanks to a generous donation from SDG&E Words Alive received $1 for every #shelfie that was posted from the community. Below are just a handful of the fun and creative #shelfies that we received this year! Thank you to all of the wonderful individuals and VIR's that spent time sharing your love of reading this year and helping to make a difference in peoples lives through reading!